Workload partition functionality, originally introduced in 2007 with the release of IBM AIX Version 6, is a strategic component of the IBM AIX Operating System. With the release of AIX V6.1 TL2 in November 2008, both the core functionality and features related to managing workload partitions have been improved and expanded. 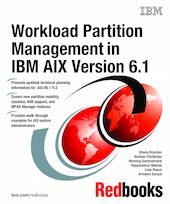 This IBM Redbooks publication provides an updated introduction and “how to” guide for system administrators and architects using workload partitions in AIX V6.1 TL2. It builds on the original concepts and practices described in the first Redbooks publication about this topic, Introduction to Workload Partition Management in IBM AIX Version 6.1, SG24-7431 , published in 2007. In AIX 6.2 TL2, significant enhancements to core workload partition functions and new features have been added. Some of the important feature updates provide more flexibility and support for enhanced mobility, improved isolation, and NIM integration. A new and significantly updated version of IBM Workload Partitions Manager for AIX (WPAR Manager), the Web browser-based graphical user interface for managing and monitoring WPARs, is also available. WPAR Manager is a platform management solution that provides a centralized point of control for managing WPARs across a collection of managed systems running AIX.